Hotel provided everything I/we needed.Everything was clean, worked,was of a reasonable standard and not too expensive for Singapore.PLUS it had a lovely shower AND bath tub + water temperature,control and supply was first class. I really like our room. A bit small but its ok. Value for money. the room is clean. the staff is nice because i ask to change rooms, no problem. The only thing I liked was that the transportation was available to visit the major locations in Singapore. Accessible location and friendly and accomodating staffs, they are helpful n answering my questions about directions going to tourist spots. The price is reasonable to the size of the room. The service is great and the staff are hospitable. They clean the room and provide free bottled water(s) everyday. There’s nothing better than to go home after walking and touring the whole day with everything set for you to have a good night rest. Good area that close by many Chinese restaurant. They have nice customer service. Love the location. Good for cheap food and access to SMRT. The location was good for me and walking that I enjoy. Clean. Hotel 81 Princess This rating is a reflection of how the property compares to the industry standard when it comes to price, facilities and services available. It's based on a self-evaluation by the property. Use this rating to help choose your stay! 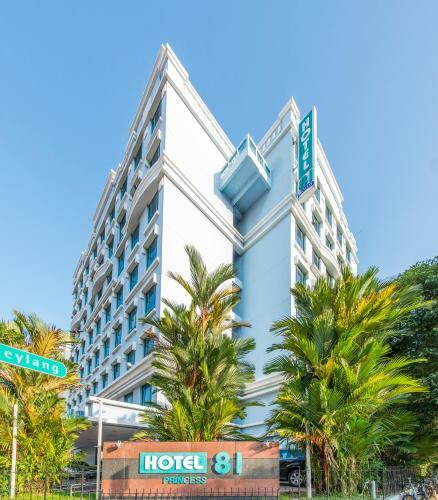 Hotel 81 Princess is located in Singapore’s bustling Geylang District, a convenient 10-minute walk from Aljunied MRT Station. It offers rooms with free Wi-Fi. It is 0.9 mi to Kallang MRT Station and Singapore Sports Hub, while Kallang Wave Mall is 1.6 mi from Hotel 81 Princess. OneKM Shopping Mall is 1.8 mi from the property. Changi Airport Singapore is 9.7 mi away. Air-conditioned rooms are fitted with an IDD telephone and a satellite TV. The private bathrooms include shower facilities and free toiletries. Guests can approach the 24-hour front desk for currency exchange and luggage storage. Guests can explore the surrounding area for a variety of shopping and dining options. When would you like to stay at Hotel 81 Princess? This air-conditioned superior double room is fitted with an IDD telephone and a satellite TV. The private bathroom includes shower facilities and free toiletries. Guests enjoy complimentary beverages. This air-conditioned superior twin room is fitted with an IDD telephone and a satellite TV. The private bathroom includes shower facilities and free toiletries. Guests enjoy complimentary beverages. House Rules Hotel 81 Princess takes special requests – add in the next step! Hotel 81 Princess accepts these cards and reserves the right to temporarily hold an amount prior to arrival. Big bed and smelled good. Small rooms. Uncomfortable beds. Annoying and a bit broken / dirty bed sheets. Good location in west Gaylang close to 2 bus stations - in less than 10 minutes to Suncity or Marina Bay. Very good location, friendly staff, everything was perfect. As soon as we got in the taxi from the airport the driver told us that the location was rubbish and dodgey, and he was right, it was in the centre on the red light district with little access to the centre/Marina Bay. The hotel was very basic. Location was okay as access to public transport but not walking distance to attractions that we were interested in so always had to get bus/taxis to the centre. Room was cramped, very noisy and could barely sleep at best of times. When it rains, water seeps into the bedroom through window slits and makes the floor wet. Do not put your belongings next to window. The shower-bathtub doesnt have a shower curtain, which makes showering is not comfortable. Close to various eating houses and buses stop. Friendly customer services. There was no hot water during my stay.Rooms need smaller refurbishment looks very old. Room size and clean line was good compared to other hotel. Staff helpful.